All Motorcycle Forks operate on a combination three factors. Friction: of the moving components, seal drag, etc. Friction is bad & to be minimized as possible. Springs: carrying the weight of the bike & rider, storing then releasing energy. Damping: Oil flow thru the fork for lubrication as well as controlling the energy from the spring action. Friction is perhaps the most overlooked aspect of fork operation. Bushing condition & quality can vary; many vintage forks do not have bushings. Proper chrome on the fork tubes combined with hard anodizing sliders can may significant improvements to plushness, control & traction. Springs quality & rate varies from model to model with virtually all bikes benefiting from modern springs in the correct rate. Damping improvements go directly to rider feel, comfort & control. There are several damping systems used in vintage motorcycles. Damping rod type forks found on many vintage & classic applications from the 60-80’s (as well as many current motorcycle designs!) offer both compression & rebound damping control but don’t work very well in stock form. A damping rod fork controls the oil flow thru a series of simple fixed size holes in a tube. The problem is these holes are only the right size for one type of bump so 90% of the time they are too big or too small. For instance when the fork encounters a slow speed movement (speed the fork compresses not how fast the bike is going) from a small bump or dip the oil flows un-restricted & too quickly resulting in a vague or mushy feel to the rider. 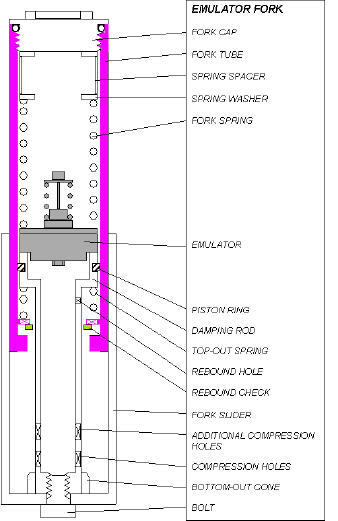 When a high speed fork movement is required from a large or sharp edge bump the damping rod holes are too small for proper oil flow resulting in harshness due to the fork not compressing fast enough. This type of fork is easily improved. A Race Tech Gold Valve Emulator will greatly improve compression damping as it is a variable valve. As the oil reaches the Emulator it is first controlled by a small by-pass hole in the Emulator Check plate. This small opening provides for a firm controlled feel to the rider when slow velocity smooth edge bumps are encountered. When a sharp or square edge bump increases the velocity of fork compression and the resulting oil flow the spring loaded check valve on the Emulator controls the oil flow acting as a variable valve, offering damping nearly identical to a Cartridge. The Gold Valve Emulator controls compression damping completely while rebound damping is controlled by oil viscosity (typically 15-30w) the Emulator offers enough adjustability to work with any weight of oil required for optimum rebound control. Imagine it this way; Place your hand over a constantly changing fountain of water. As the water flow & pressure increases & decreases vary the height of your hand up & down against the water so constant pressure can be maintained. Thus the harshness is removed from the fork action resulting in a firm yet plush ride with much greater feedback & control to the rider under varying ride conditions. While the Damping Rod type is the most common system used to control oil flow in Vintage & Classic Motorcycle Forks there are some other systems used. Second to the Damping Rod style the Damping Tube style (aka Road Holder Forks) is the most common. Found in many European & some early Honda Forks using either external fork springs or internal springs as pictured here. The Damping Tube can be mistakenly identified as a Cartridge (like those found in Modern Street & Dirt Bikes) due to its appearance. A large metal tube bolts into the bottom of the fork slider with a rod attached to the fork cap looks suspiciously like a cartridge but is not. Unlike a cartridge equipped with bending shim stack variable valves controlling compression as well as rebound damping the vintage damping tube (#20) controls only rebound damping via a series of holes thru a slug for oil flow (#21) inside the tube, moving up & down via the rod (#14) attached to the fork cap with a nut (#15). This system works reasonably well when the forks are clean & fresh. It responds well to oil viscosity changes & modern fork fluid. However as there is no compression damping control or bottoming stop mechanism it has significant limitations for control & traction. This system is not significantly improved upon short of replacing the damping tube with a modern Cartridge. This is a dramatic improvement offering truly modern performance albeit expensive. Some early Japanese fork damping systems consisted of a simple check valve at the bottom of the fork tube that offered mediocre compression damping control with no rebound damping. This was in effect the reverse of the damping Tube System. In some cases Gold Valve Emulators in conjunction with sealing rings can be adapted to provide improved compression damping as well as rebound damping. And of course there are some forks with no damping control system at all, using extremely heavy oil to create some very minor control is the only option for these low tech forks.